Cailin, an AIEF freshman scholar, is approaching her 19th birthday and lives with her parents and two younger siblings. We recently connected with Cailin in Farmington, NM during one of her busiest times as a first year college student — finals! When we reached out to her, we offered to meet her during the weekend, but her job at a local store was taking up most of her Saturday and Sunday. We settled on a Monday morning, but only after she dropped her siblings off at school first thing in the morning. Cailin was busy — no doubt! She explained that her family originated from the Huerfano Chapter of the Navajo Nation, which was located in the northeastern portion of the Eastern Agency and about 30 miles southeast of her home. She had spent her preschool years in Yuma, Arizona while her father served in the military. 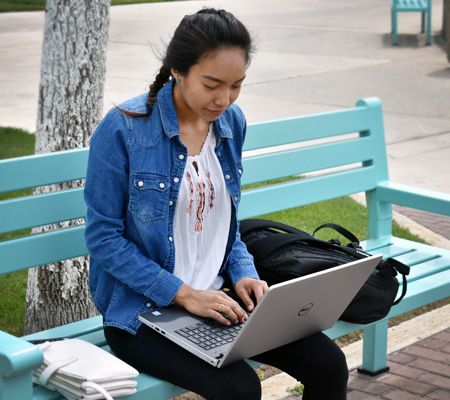 Cailin received a new laptop, a backpack and the necessary software she needed to be a college student. In Cailin’s essay, she originally planned to attend Fort Lewis College in Durango, Colorado. 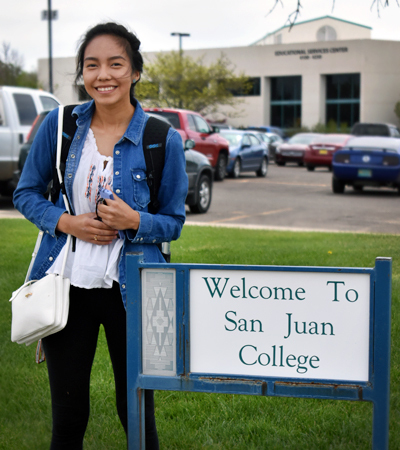 Even with this college offering free tuition for Native American students, the other expenses were beyond her reach financially. Instead, she decided to stay close to home. That decision was made after she contemplated taking a gap year, but her father convinced her to stay in school. She was thankful for his advice. Cailin was grateful for all the support offered by AIEF in her educational goals. It was not only the monetary scholarship she received, but she shared that the $2,000 paid for her classes for both her first and second semester as a freshman student. Her college was “really reasonable” and she even had a little extra money in her second semester to purchase books. 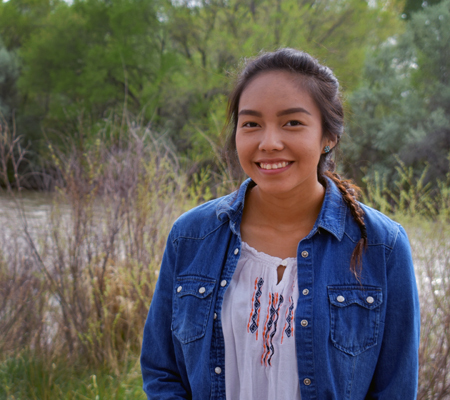 Cailin originally planned to attend Fort Lewis College in Durango, Colorado but decided to stay close to home. Cailin wants to study Physical Therapy. Getting into the program at her college is really competitive, but she is hopeful that she will move forward with her commitment and hard work. Hard work during her secondary education meant she took dual credit courses. She had over 20 college credits as she transitioned into college. As Cailin approaches her 19th birthday, she has to balance family, college and work — a pretty impressive feat. Everyone with AIEF is so proud to support this determined, young woman!